North-west Yunnan has enchanted travellers and explorers for centuries – from Marco Polo in the thirteenth century to Joseph Rock and fellow botanist Frank Kingdon Ward in the early years of the twentieth. Today, this region’s incredible diversity of plant and animal life, and the large number of ethnic minorities that make this area their home, make this part of Yunnan Province a wonderful and colourful region of China to explore. On this journey, you will travel to tiny rural backwaters to shoot photographs of local people in traditional dress, drive through beautiful mountainous regions with amazing panoramas, and wander cobbled streets in well-preserved old towns and feel as though you and your camera are travelling back in time. The extraordinary accommodation: from the Linden Centre, a converted traditional Bai courtyard family home, to the secluded Songtsam mountain valley lodge in Tacheng, to the traditional Tibetan style dwelling at the Songstam Shangri-La. Explore the the shores of Erhai Lake both at sunrise and at sunset. Visit the old town of Lijiang and it’s cobble stoned alleyways, a UNESCO World Heritage Site, and the beautiful valley at the foot of Jade Dragon Snow Mountain. Travel through parts of one of the world’s most bio-diverse regions, the Three Parallel River nature reserve, and come up close with one of the world’s rarest primates, the Snub-Nosed Golden Monkey (full itinerary). Meet the monks at Shangri-La’s Ganden Sumtseling Temple and witness a private prayer session especially arranged for our group (full itinerary). Tutorials conducted on composition, light, landscape, architecture, and portrait photography. Amazing photographic opportunities from minority village markets, to dramatic landscapes surrounding the historical mountain kingdoms, to the cobbled streets of ancient towns. Unique opportunities to work with and create portraits of members of ethnic minority villages. Visit and photograph a traditional Tibetan home and its family members (full itinerary). Improve your low light photography skills during a private prayer session with monks (full itinerary). Guidance and instant feedback from Ron while photographing out in the field. Present your favourite shots of the trip to the group at a ‘show and tell session’. You will arrive in Kunming in the early afternoon according to your own arrangements. We will pick you up at the airport and take you to Kunming’s best hotel by the side of the city’s Green Lake. If you require a temporary Chinese driving license, we will complete your application straight after your arrival – fortunately this is a short administrative procedure. Afterwards, take a stroll around the lake to get a taste of the easy-going pace of life in one of China’s most pleasant large cities, before having dinner in a beautifully restored Qing-dynasty house. Today we will drive to Dali and on to Xizhou, home of the Linden Centre – a lovingly converted Bai minority mansion, where you will stay for the next two nights. In the morning, will set out from Kunming and drive along a world-class highway until we reach Chuxiong – today’s lunch stop. After lunch continue west and north toward the picturesque town of Dali, formerly capital of Yunnan’s independent Nanzhao Kingdom. Dali lies on a strip of land between the brooding Cangshan Mountains and Lake Erhai, a beautifully scenic location. Continue north for a short distance to the tranquil village of Xizhou. Xizhou boasts some of the best preserved Bai courtyard homes from the Qing Dynasty, and prior to 1949, was the major centre for Bai commerce. In the afternoon, Ron will conduct an optional technical photography class, to simplify and emphasize the most important functions on the camera – the knowledge base with which subsequent lectures and field sessions will build upon. We will then explore and photograph around Xizhou. After dinner, a lesson on composition will help prepare you for tomorrow’s activities. Explore a nearby courtyard market in the shade of large Banyan trees. After an early lunch in the Linden Centre, we will visit a fabric dying home before enjoying a fantastic late afternoon drive along the shores of Erhai Lake. We will then drive into Dali for dinner and then return to the Linden Centre for the evening. You will have your first chance to practice your composition skills in the morning at the courtyard market. After lunch, Ron will conduct a class on taking portaits, and then we will visit a fabric dying home where you will have an opportunity to photograph both the action as well as setting up your own portraits of the Bai workers. We will head down to Erhai lake to enjoy sunrise where the morning light glistens off the water. After breakfast, we set out along a lovely country road for Lijiang. Lijiang, former capital of the ‘Nakhi Kingdom’, was introduced to the West by eccentric American botanist Joseph Rock in the 1930s and 40s. The cobbled streets of Lijiang’s old town, a UNESCO World Heritage Site, run alongside crystal clear streams and up the steep slopes of Lion Hill, from where you can enjoy a wonderful view to 5,600 metre (18,370 feet) high Jade Dragon Snow Mountain. We will explore the old town in the late afternoon and dusk, as well as have dinner there. There will be opportunities for some lovely sunrise photographs on the shores of Erhai Lake and perhaps capture a fisherman or two at work. 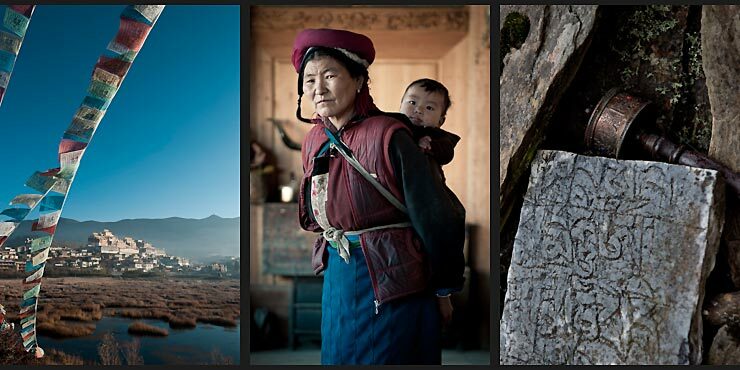 A class on how to shoot architecture and landscapes will be conducted in preparation for your time in Lijiang. We will take a short walk up Lion Hill in the late afternoon for photos looking over all the rooftops of the old city. After an early dinner, we’ll capture dusk scenes in the heart of the old town when the light intensity on the streets matches that of the sky above. In the early morning, we will return to Lijiang’s old town, and continue our exploration in different areas. The quietness of the mornings contrast heavily with the bustle of the previous evening, and you will see the town from a completely different perspective. After lunch, visit the tiny village of Yuhu, Joseph Rock’s home while he was stationed in the Yunnan region. Yuhu is a quaint Naxi minority village tucked up close to Jade Dragon Snow Mountain. We will have a relaxed barbeque dinner in a courtyard home in Yuhu before returning to Lijiang in the early evening. Walk around the old town in the quiet of the early morning to experience and photograph the town as it was in years gone by. In the village of Yuhu, we will arrange a special portrait session with several Naxi villagers and their horses and you will be free to roam with them and decide on your favourite areas to photograph. For those on the shorter, core itinerary, we will take you to Lijiang airport in the morning to begin your journey home. For those joining the full itinerary, we continue further north at first along the the G214, the main road from Yunnan to Tibet, and then turning onto a provincial road to follow the course of the Yangtse River. Shortly after, we reach the “first bend of Yangtse”, held in high regard by the Chinese, where we will stop on the shores at this U turn in the river for lunch. We will then continue along the Yangtse in a broad, but gradually narrowing valley. We will then leave the river, and eventually reach a beautiful lodge in the idyllic hamlet of Hada in a secluded region of the province. This lodge, in Tacheng county, is located between the Yangtse and Mekong Rivers, the area home to significant old-growth forests. Tacheng is rich in Tibetan culture as well as Naxi and Lisu ethnic minority villages. The endangered Yunnan Golden Monkey, with less than 2,000 members in the wild, is found here. They live at the highest altitude (up to 4,500m) of any primate other than humans. There will be photo opportunities along the Yangtse River valley. In the late afternoon, we will visit a small village near the lodge for you to observe and capture images of rural Naxi life. Today we will visit the Golden Snub-Nosed Monkey reserve in the morning before returning to the Songtsam Lodge for lunch and then driving along country roads to Shangri-La. Though Shangri-La is far from Lhasa, the region is saturated with Tibetan “flavours”, from red robed monks and golden roofed temples to the weathered faces of the Tibetan people. Colourful prayer flags, white stupas that protect the land, and robust Tibetan homes dot the landscape. We spend the next two nights at the Songtsam Hotel, a fantastic retreat housed in traditional Tibetan dwellings and next to the huge Ganden Sumtseling Monastery. We will drive to the Golden Snub-Nosed Monkey reserve and then take a short hike to the feeding grounds. You’ll have many chances to photograph the monkeys in their natural habitat as they emerge for their morning meal. A telephoto lens is useful here, but the monkeys can approach to within a couple meters. We will spend the morning exploring the landscape around the Ganden Sumtseling Monastery and then head inside where we will be able to meet the monks. After lunch in Shangri-La’s old town, we will visit a traditional Tibetan family home and go to a hidden Buddhist shrine where the surrounding forest is covered in hundreds of thousands of prayer flags. The first part of the morning, we will capture landscapes around the monastery, where you can test your ability to produce images with good foreground and background balance. In the later morning, we will enter the monastery where you may have an opportunity to photograph the monks in a debating session. You will then be able to capture images of the monks during a private prayer session that has been specially arranged for our travel group. In the afternoon, we will have some portrait opportunities in a traditional Tibetan home as well as chances to get very creative in a forest blanketed with countless prayer flags. Finally, after dinner, we will have a light hearted and fun photography wrap up session where everyone will choose their favourite photos from the trip and we will project them onto a large screen where Ron, and anyone else, can provide feedback and comments. Today you will start your journey home. After breakfast at the hotel, you will be taken to Shangri-La’s small airport to catch a flight back to Kunming (the flight takes fifty minutes, and is included in journey). You will be free to start your onward journey from Kunming any time after noon today.